Around 270 students convened outside Senate House this afternoon and marched past several Cambridge colleges in protest against investments in fossil fuels and arms companies by Cambridge University and several of its constituent colleges. Protesters called for the University and colleges to “divest, disarm, decolonise’ as they marched through central Cambridge, past Emmanuel, Christ’s, before walking to the back of Old Schools, the University’s central administrative building. Protesters lit off flares as they marched – one protester put a lit flare at a keyhole in the door of Old Schools. And banging on the back door of Old Schools, protesters broke the door’s lock, chanting “Who wants to break the door? We want to break the door”. The rally was jointly organised by student activist groups Cambridge Decolonisation Network, Demilitarise Cambridge, Cambridge University Palestine Society, Cambridge Zero Carbon Society, and Cambridge Defend Education. One student, speaking to the group as they stood outside the back door of Old Schools, called for “restructuring” of the University’s investment and bursary systems, referencing the recent resignation of Nick Cavalla, Cambridge’s chief investment officer. Another speaker said: “We demand an end to their revolving door. We will bring it to a grinding halt”. As they walked along King’s Parade, rally-goers chanted “BAE has got to go”, referencing arms manufacturing company BAE Systems – a recent Varsity investigation found that Trinity and Darwin colleges hold investments in BAE Systems totalling more than £400k. The rally follows recent revelations concerning Cambridge college investment in arms companies and fossil fuels. 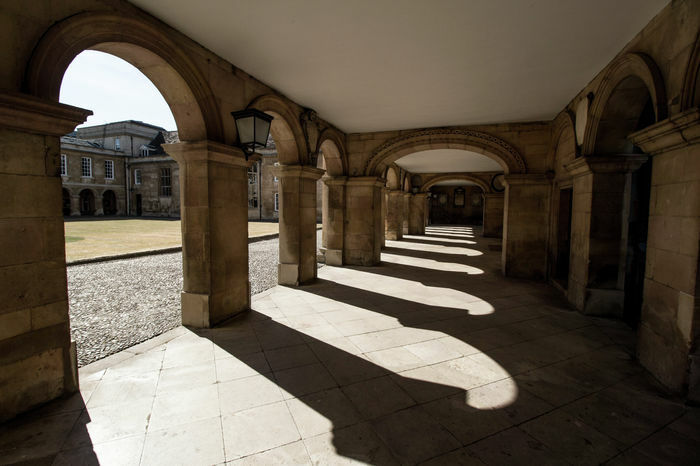 Last week, Varsity revealed that of the 20 Cambridge colleges which responded to a Freedom of Information request, seven hold investments worth £20.7 million in corporations engaged in oil and gas exploration, production and refining. With £9.1m invested, Trinity College currently has the largest investments in oil and gas companies across Oxbridge, with Emmanuel College following with £5.7m. The list also included demands for “an end to the appearance of arms companies, fossil fuel companies, the UK military, and security on campus at career events, at freshers’ fairs, and other arenas of recruitment”. A spokesperson for Cambridge Zero Carbon said, “We stand together with campaigns from across the University to demand immediate divestment, disarmament, and decolonisation. We are united, and we will win”. Earlier this month, members of the Zero Carbon Society disrupted the Royal Dutch Shell annual lecture and last week dropped banners across 11 colleges, calling for the colleges to divest from fossil fuel companies. Calls for the university to divest from such companies picked up steam last year, culminating in a six-day occupation of Greenwich House – a key University administrative building – by members of Cambridge Zero Carbon in May, as well as a six-day hunger strike by three student activists in lead up to the decision on divestment by University Council. In June, the Council voted against calls for full divestment of its endowment from fossil fuels, instead reaffirming its stance of ‘considered’ divestment, which involves avoiding direct investment in coal and tar sands and keeping indirect investments to a minimum. The Council also rejected recommendations by its divestment working group to invest 10% of its indirect investments into Environmental, Social, and Governance (ESG) Funds, instead opting to employ an ESG Officer in Cambridge’s Investment Office.